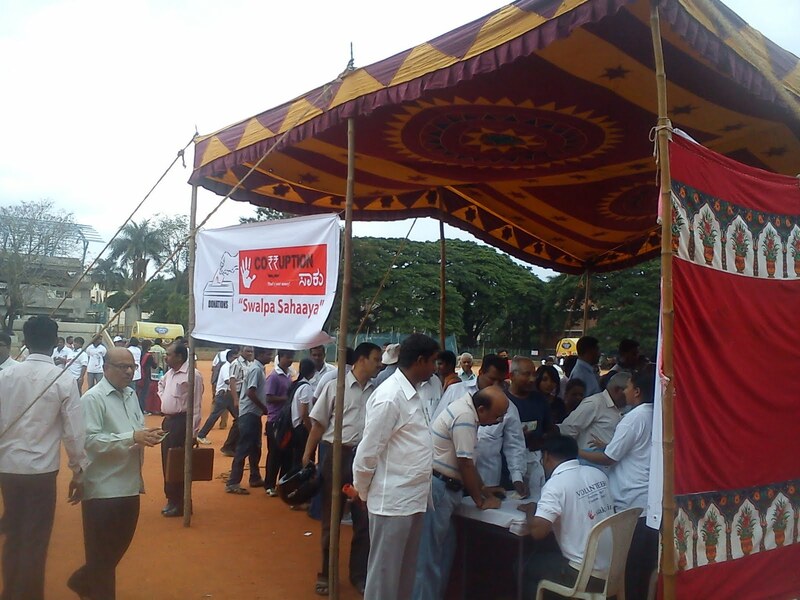 It was a hot Saturday afternoon at the National College grounds in Basavanagudi, Bangalore. The Sun was unusually blazing on the crowd that was gathering fast. 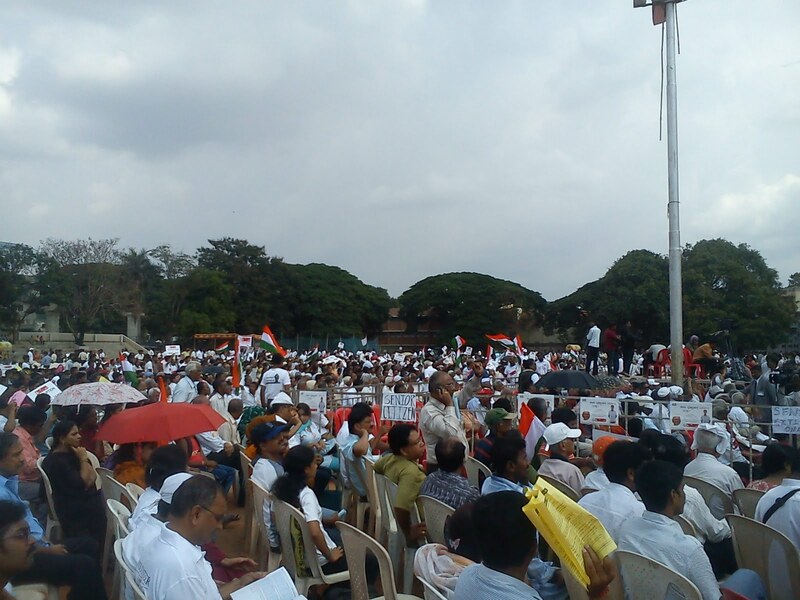 The huge ground was dotted with people decked up in bright white T-shirts that said "Corruption saaku, Jan Lok Pal beku", which when translated to English means, "Enough of corruption, we want Jan Lok Pal". The atmosphere was charged...there was lot of activity...volunteers distributing T-Shirts, drinking water, butter milk, badges against corruption and some collecting donations...a band playing music on stage...public slowly milling about and finding seats. I felt as if I am being drawn by some invisible force at work, a force that was subtle but nevertheless powerful and so confident. As the crowd waited for Anna Hazare to turn up, I got into conversation with Arpit, a young volunteer who works for Deloitte. We felt that, of all the places, the setting of Bangalore itself for this afternoon was a little ironic especially because the karnataka state Government was perceived to be one of the most corrupt state governments in the country! Or was the venue, on the contrary, very apt? For this place also boasts of one of the most cosmopolitan educated populace! I exchanged numbers with Arpit who I also learnt was part of the movement from its cubbon park days. Kiran Bedi was the first speaker of the afternoon. In chaste Hindi, she recounted the days of the movement's inception. When Arvind Kejriwal (credited to be one of the chief brains behind the Jan Lok Pal bill draft now) came to meet Bedi in the October of last year (news of CWG, Adarsh society and 2G scams were hot then), Bedi decided to act against corruption. She, along with Sri Sri Ravishankar, Baba Ramdev, Arvind himself, Swami Agnivesh and Anna Hazare filed a FIR on 14th November against the corrupt. That was the first time, the police even accepted and registered an FIR. She said that corruption at three levels - politics, bureaucracy and business - needs to be fought. When she said that out of every 100 rupees the Government spends, 84 gets corrupted out, it was disheartening. Swami Agnivesh, the next to speak, hailed Anna Hazare as the symbol of this movement against corruption. He declared that, it is neither the Maoists nor the naxals that are the country's biggest internal security threat; it is the corrupt whose black money is stashed away in numerous banks outside the borders. Arvind Kejriwal patiently and in common man's lingo, explained the salient features of the bill. He ran the crowd through some difficult times the team had to go through. Asked to declare their assets and give sources of donated money, Arvind and team swung to action and put up all the information demanded of them in no time, online. "Un ke paas paisa hai, resources hai, lekin hamare paas sirf sachaai aur irmaandari hai", he said. He then requested the crowd to investigate and come up with a list of 50 most corrupt people in every state. This list will be the first one, the Lok Pal team would act on, he promised. 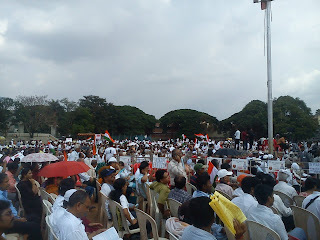 Anna Hazare was the last person to address the crowd. He was not very charismatic but something about his unassuming nature and sincere words connected readily with the crowd and it lapped up all his words like a hungry animal. He reiterated that his crusade is directed only against the corrupt. "I have only a pillow and a plate; I live in a temple; I don't even remember some of my relatives' names and I don't have any bank balance; I have led a very clean life that no one can ever point any finger at me..." Drawing from his own experience, he said "Thorns are laden in the path of social work, but once that short path is traveled, there would be greenery all around"
He exhorted the gathering to practice purity in thought and word, lead clean lives and indulge in sacrifice. "Happiness comes from within. If you want to be happy, make others happy" It was reminiscent of something traditional, something rooted more in a strong sense of values. If that is what the society needs now, it is time we embrace it! The gathering started to dissolve when one of the volunteers announced that approximately 49000 rupees was donated by the public that afternoon to the movement. It would go towards meeting the expenses of logistics involved in organizing the afternoon's gathering.